Jean Claude, what's up? You left NYC and started the Rochester Rubber Rooms, then flew out to Chicago to make people squirm there, now what??? Please dont return to NYC. Chicago Public Schools CEO Jean-Claude Brizard, one of Mayor Rahm Emanuel’s premier hires, is out by “mutual agreement” with City Hall after just 17 months on the job, the Chicago Sun-Times has learned. Brizard leaves his $250,000-a-year job to be permanently replaced with Barbara Byrd-Bennett, a former teacher, principal and Cleveland schools CEO who has been filling in as Chicago’s interim chief education officer for the past six months. Byrd-Bennett, 62, played a pivotal role in negotiating an end to the strike — and upstaged Brizard in the process. Terms of Brizard’s exit were still being finalized, but are expected to include a full-year’s salary. On Thursday, Emanuel said the decision for a change was made during “two to three separate conversations” in recent days. “The questions about J.C. became a distraction from what we had to do. We had a mutual agreement [that the distraction was] not helpful. . . . I didn’t have to come to that conclusion myself. We both agreed together. It kept on becoming about the static and noise about J.C. 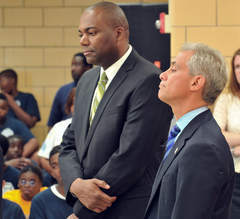 He said, ‘Look, getting the schools right is more important than me,’ ” the mayor told the Chicago Sun-Times. Emanuel credited Brizard with engineering a “breathtaking amount of change” before concluding it was time to step aside. Brizard did not respond to requests for comment. seen tremendous growth on the ACT – an important college readiness benchmark,” Brizard said in the statement. “I have three young children. It is time to focus on their development. We all know the best gift that you can give to a child is time. “I leave this role with great sadness, but with the knowledge that the seeds for true innovation and transformation have been planted. They only need to be cultivated,’’ the statement concluded. Another source pointed to the turnover in the “second-and-third-layers” of leadership handpicked by Brizard. Brizard’s original pick for an office of community engagement that he elevated to a cabinet level position came on board last fall and left in the spring. That led to a “very contentious engagement process” preceding the school board’s decision to close or turn around 17 underperforming schools. “He’s really good on the education side and understanding policy. It’s more about management and leadership and hiring people who weren’t the right fit for the right positions,” the source said. Despite an increase in high school test scores and graduation rates, speculation about Brizard’s impending departure has been rampant. He infuriated the mayor by going on a family vacation in the run-up to the strike and was mortally wounded by a Chicago Tribune story that claimed he was on his way out. City Hall believes that story, which included a mixed review of Brizard’s performance, may have been leaked by the CEO himself in an attempt to shore up his position with the mayor. Emanuel gave Brizard a lip-service vote of confidence, but it was only a matter of time before his exit. Brizard’s absence during contract negotiations kept the rumor mill churning. At one point during the strike, he was placed in the humiliating position of having to send an e-mail to CPS employees denying that he had resigned. It happened after a union member announced Brizard’s resignation at a school rally. “The reports of my demise have been greatly exaggerated,” Brizard wrote on that day. City Hall insisted after the strike ended that CPS would be “J.C.’s show once again.” But it wasn’t to be. Emanuel denied that Brizard’s departure was a political embarrassment for a mayor who has made education and lengthening the school day and year his signature push. “This is not embarrassing. What would be embarrassing to me is not succeeding in school reform. What would be harmful is allowing a problem to fester when I needed to show leadership to do something,” the mayor said. Chicago Teachers Union President Karen Lewis said late Thursday that the revolving door of appointments to lead the nation’s third-largest school system is disconcerting. Brizard, a former New York City physics teacher and the son of Haitian immigrants, is not the first outsider to crash and burn in a high-profile Chicago job. And, his three-year Chicago Public Schools contract is not the first contract he failed to fulfill. Brizard bailed out of a contract as superintendent of schools in Rochester, N.Y. — a system of only 32,000 — to serve as Emanuel’s education point man in a district of more than 400,000 students. Antennas were raised right from the start when Emanuel introduced Brizard to reporters and then stopped him from answering any questions. However, Brizard proceeded to push through Emanuel’s campaign promise of a longer school day by offering schools and teachers extra money to waive the teachers contract and sign up for a longer-day pilot. He led the implementation of a tougher “common core” curriculum and a new teacher evaluation system — all dramatic changes to the local education landscape. Sources said Byrd-Bennett has decided not to fill the chief education officer’s job she is vacating. That will return the system to the management structure it had for decades until former Mayor Richard M. Daley’s 1995 school takeover. That is, a superintendent who serves as both CEO and chief education officer, similar to the head coach and general manager of a professional sports franchise. “Barbara is in it for the long haul. She wants to get CPS to the next level. The hope is, this is it. We get to buckle in for a while. The system needs stability,” the City Hall source said. “The debate has become so polarized between reformers and union folks, but Barbara transcends both and that’s a tremendous strength. She’s a unique character who plays in both ponds,” the City Hall source said. By TAMMY WEBBER and SARA BURNETTCHICAGO -- Just three weeks after Chicago teachers returned to the classroom following a bitter strike, Mayor Rahm Emanuel accepted the resignation of his schools CEO and replaced him with a veteran educator and administrator who he said had the experience to take Chicago school reforms "to the next level." Chicago Public Schools CEO Jean-Claude Brizard resigned by mutual agreement after "constant questions" about his oversight became a distraction to the mayor's reform goals, Emanuel said at a news conference Friday. Brizard announced Thursday night that he was stepping down after just 17 months. 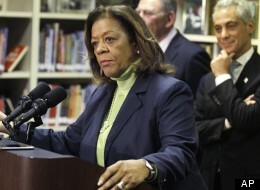 Emanuel moved quickly to name a permanent replacement: Barbara Byrd-Bennett, a longtime teacher and administrator who had been serving as Chicago's interim chief education officer and played a far more visible role than Brizard in the teacher contract negotiations. Byrd-Bennett, 62, who started her career as a teacher in New York schools, also served as a principal and superintendent there before taking the job as CEO in Cleveland Public Schools and later as chief academic and accountability auditor for Detroit Public Schools, where she was in charge of implementing a teaching and learning plan and auditing academic programs. Emanuel said the new teacher contract that includes a longer school day gives the district the chance to take reforms "to the next level," and to do that ... "you have to have the right person who has experience in front of class as a teacher, a person who also has the experience as a principal being held accountable for the results of that school building ... (and) you also need a person who understands how to manage a major school system," Emanuel said. Rumors had circulated for weeks that Emanuel was unhappy with Brizard's performance, but the mayor denied it, saying just after the strike ended that "J.C. has my confidence." Still, Brizard's first performance evaluation by the school board raised concerns about his communication and decision-making skills, and he was not involved in teacher contract negotiations – though Byrd-Bennett was. Brizard, a native of Haiti, came to Chicago last April from Rochester, N.Y., where he had a frosty relationship with teachers and more than 90 percent of them gave him a vote of no-confidence. School Board President David Vitale said Brizard initiated the discussion that led to his resignation, telling Vitale he was concerned he could no longer be effective. Vitale then took the problem to the mayor. The resignation was first reported Thursday night by the Chicago Sun-Times. "He was constantly questioned about his leadership ... he ultimately concluded that it wasn't going to work," Vitale said. He said one of those repeated questions was who was actually in charge: Brizard or Emanuel. "The mayor was not running the system. The board was overseeing the work of (Brizard). And if there was confusion about that, it's unfortunate, and it may in fact have been part of the problem why Jean-Claude didn't feel he could be successful, because he couldn't clear up that confusion, despite efforts by the mayor, efforts by me within the system to basically say `He's the CEO.' And he was," Vitale said. Emanuel later made a point of saying he wasn't running things. "I am clear about what our goals are, I monitor and hold people accountable to achieving them," the mayor said. "But I don't do the day-to-day work." Emanuel praised Brizard's professionalism and said he should be proud of the work he did, including laying the groundwork for the longer school day and school year. "Hold your head high," he said. Byrd-Bennett said her 44 years in education have prepared her for the job in Chicago and she's here "for the long haul." She said her first phone call after learning she was being promoted was to Chicago Teachers Union President Karen Lewis, for whom she has "great respect." "We need to do this work together ... (and) I plan to build the necessary coalitions," Byrd-Bennett said. Lewis, who was critical of Brizard when he was hired, did not immediately respond to a request for comment. But other union leaders praised Byrd-Bennett as knowledgeable and experienced. Adam Urbanski, president of the Rochester teachers union that clashed with Brizard, said he and Byrd-Bennett served as co-chairs of an American Federation of Teachers advisory board and she understands both teachers and unions. "I think she has a more promising track record of being able to work more collaboratively with teachers," Urbanski said. "I'm hopeful that her experience in Chicago will help to stabilize the relationships and figure out ways to move forward together." Associated Press writer Herbert G. McCann contributed to this story. More than three weeks after the Chicago teachers’ strike ended, Chicago Public Schools CEO Jean-Claude Brizard is out by “mutual agreement,” after less than 18 months heading the city’s school system. In my 26 year career in education, I have had many different roles with one commitment — the success of students. As an educator, I knew for students to be successful here in Chicago we needed to refocus the District to work on the fundamentals of teaching and learning, developing a new framework for teaching. Some have called it a masterpiece. The credit belongs to my hard-working team including many teachers and principals who contributed to the work. As the district leader, I am proud of the results we achieved in such a short time: graduation rates are up, test scores are improving, a higher percentage of freshman are on track for graduation, we achieved the lowest one-year drop-out rate in the city’s history and we have seen tremendous growth on the ACT – an important college readiness benchmark. As I move on to the next chapter of my career, my commitment to the success of students and the elimination of inequities within our educational system remains the same. I have three young children. It is time to focus on their development. We all know the best gift that you can give to a child is time. I leave this role with great sadness, but with the knowledge that the seeds for true innovation and transformation have been planted. They only need to be cultivated. CHICAGO -- When teachers on strike took to the Chicago streets for nine days this month, news cameras followed the union president, the head of the school board and the mayor. The Chicago Teachers Union and city representatives would meet for hours, negotiating technical contract details. A throng of reporters was always waiting outside for the latest update. But the CEO of Chicago Public Schools, Jean-Claude Brizard, was nearly invisible. As the strike began, Brizard had just come off a shaky performance review that so reverberated around Chicago that Mayor Rahm Emanuel had felt compelled to publicly voice confidence in his first schools chief. Aside from a brief appearance at Emanuel's press conference the night the strike news broke, Brizard has defined low-profile over the last two weeks. So what was Brizard up to? "I got in a car and drove from school to school," he told The Huffington Post in his first lengthy interview since the strike ended on Sept. 18. From the beginning of the strike, Brizard said he engaged with teachers on the picket lines from 6 a.m. until lunch. "Things were raw," he said. He specifically sought places where reporters would be scarce. On Sept. 10, the first day of the strike, at the first school where he stopped, Brizard recalled, "They told me, 'Try and fix this quickly,'" and they said, "We just want to go back to our schools." Next, Brizard visited Disney Magnet School. "I was surrounded by teachers," he said. He remembers they were shouting, "Brizard, Emanuel, give us our money back." Brizard said, "And I thought really, what money did I take from you?" (They were likely referring to the contractual 4 percent raise Emanuel denied the teachers last year.) Then, the school's union leader came out and "we talked for really good minutes" as the others listened. "I spent a week doing that," said the schools chief. For the most part, Brizard said, teachers were happy to have his ear -- until he reached a school on Chicago's South Side where he said he was told to "go effing back to New York." So he said thank you, waved and drove away, he recalled. "My goal was to try and build community so when this was over, it wouldn't be horrible," he said. At lunch time, Brizard would go back to the school district's central office to monitor how Chicago's strike contingency plan was serving students. Sometimes, when the union's rallies filled the surrounding streets, he couldn't get into the building. When he did, he would stand in an area with wall-to-wall windows, listening to what Chicago Teachers Union president Karen Lewis and American Federation of Teachers president Randi Weingarten told the throngs of teachers outside. But he made sure to stand where he was invisible to the crowds. "As much as I engage teachers on the picket line, I was not going to engage 4-5,000 teachers on the street," he said. His absence from the public stage during the strike stoked a rumor that he had resigned. A union member said as much at a rally, and it lit up Twitter, forcing Brizard to respond with a Mark Twain-esque email to school staff that declared, "The reports of my demise have been greatly exaggerated." "I don't expect to be fired, but if the mayor decides I'm not the right person for him, that's OK," Brizard said. According to Brizard, he communicates regularly with Emanuel, although he has not observed the mayor's notorious use of colorful language. "I have not experienced that side," said Brizard. "What I experience from him is someone who ... listens," he added. "I have to be honest about that. This is where people may or may not agree. I find that if I push certain ideas, he listens." "I've never been a yes person in my life and will not be," Brizard said. "Whenever I push back, I've gotten to know him in the sense that, if you push with data, ... he listens." As an example, Brizard said that Emanuel wanted to dramatically increase the number of selective magnet schools, but when Brizard showed him the effects that move would have on other schools, Emanuel changed his mind. 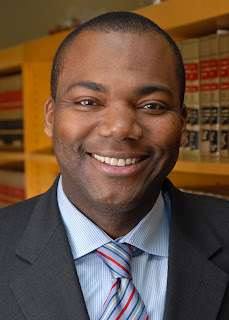 Before he arrived in Chicago in 2011, Brizard, who was born in Haiti, led Rochester's schools in upstate New York, a messy situation that included fights with the school board and the teachers union. Though Brizard said the reason why the teachers felt a strike was necessary remains unclear to him, he conceded that "there were some mistakes made" in his administration's early days. One of those mistakes, he said, may have been to oversell charter schools as a solution to systemic stagnation. "What you hear is the rhetoric and pushback to 'this is the answer,'" he said. "At the same time, what's been missing is that there's not been a robust conversation about neighborhood schools." He said he also could have been more vocal about the "effort to shut down lousy charter schools." Another mistake, Brizard noted, was that "we didn't understand the relationship that existed" between the teachers and the administration. The distrust among teachers, he said, goes back several school chiefs. "Teachers in some ways feel marginalized by the system," Brizard said. "They hadn't been nurtured, they felt. There's not been an education conversation, a pedagogical system."